Asker: I guess you could eat cranberry sauce. Asker: Oh, and mashed potatoes. Oh, wait, those have milk in it. Oh my God, you can’t eat butter. Or gravy. What about stuffing? No, you can’t even eat stuffing. Asker: Do you make those fake turkeys? The tofurkeys? Pleasure and veganism are not separate entities. They can easily walk hand-and-hand on their idyllic organic farm somewhere in Vermont, and when those two get together, it is cataclysmic for the tongue. So here are some of my favorite tastebud sensations, and I’m only giving a few recipes because just like vegans, the recipes can be intense. Do not be intimidated. It’s not more intense than killing a turkey, plucking it, and basting it before shoving it in an oven for hours on end! *Warning: This stuffing is so good that you might bite your own tongue to test if you are dreaming! In a medium saucepan, add 1 + 1/2 cups water, quinoa [total 1 cup], season with salt and bring to a boil. Reduce heat, cover and simmer about 15 minutes, until all the water is absorbed. Remove from heat and let cool. Cover baking sheet with foil, spray with non-stick, add sweet potatoes, onions and garlic. Drizzle with olive oil and season with salt and pepper, toss to coat. Roast for 20-25 minutes, until soft. 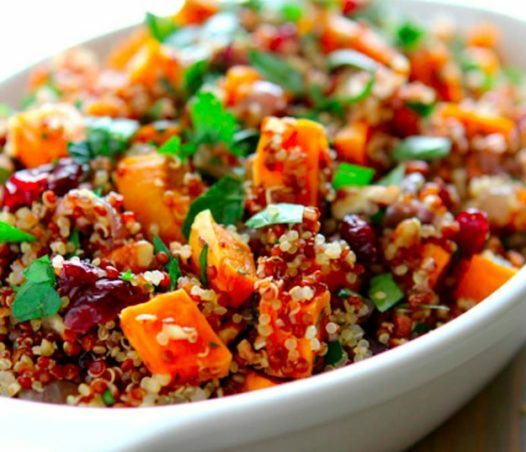 Combine sweet potatoes and onions with cooked quinoa. Drizzle with olive oil [optional]. Stir in cumin, cranberries, toasted pecans and parsley. Season with salt and pepper. *New Orleans addition: Get some fresh pecans (from your own yard or from Cane River Pecan Company) to make this crunch so good that you’ll wish you had nutria teeth! *Warning: Wild rice might make you want to punch someone because it takes so long to cook. Go in prepared. Think of wild rice as that super drunk friend who refuses to leave the bar. You know you’ll win in the end; it just takes some patience and finesse. Heat the oven to 450 degrees F and place the rack in the center of the oven. Place the 4 squash halves, cut side up on a baking sheet, brush each half with the melted Earth Balance or butter. Make sure to brush the tops and the centers of each squash so that the entire surface area has been coated. Sprinkle each half with some of the brown sugar and season with salt and pepper. Roast in the oven until just fork tender, about 20-30 minutes. 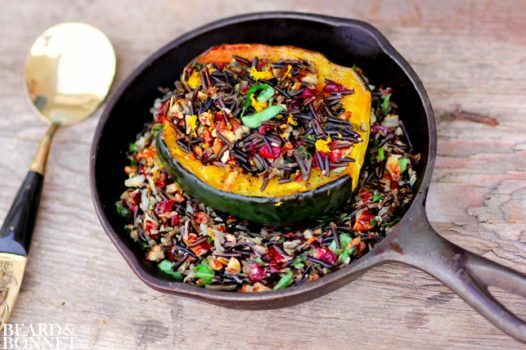 In a large mixing bowl, combine the warm wild rice, pecans, cranberries, basil, and orange zest. Stir well to combine and pour in the orange juice and season with salt and pepper. Taste and adjust seasoning as necessary. *You could also add a tablespoon of olive oil if you would like. Divide the wild rice mixture among the squash halves, about a 1/2 cup each. *You will have some of the rice mixture left over, store it covered in the refrigerator. Return the stuffed squash to the oven and continue to bake at 350 degrees F for an additional 20-25 minutes or until the squash are fork tender and golden brown around the edges. When ready to serve garnish with additional chopped basil and orange zest if desired. *New Orleans addition: We love the sweet and savory in Nola, so slap on some Slap Your Mama and mix your sweet with spicy! 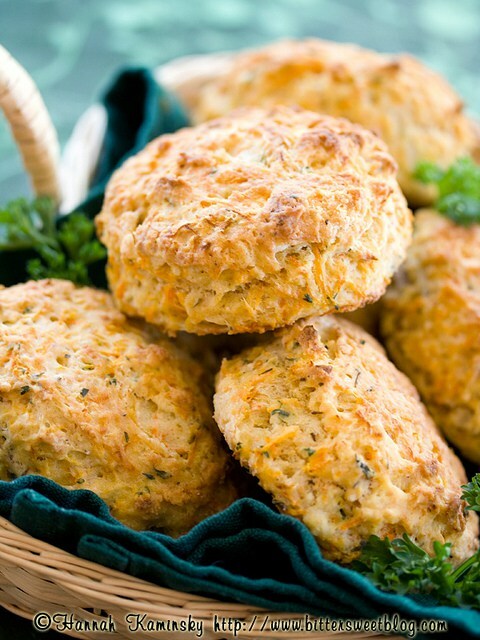 *Warning: Non-vegans will try and monopolize these biscuits. Tell them there are Popeyes biscuits in the kitchen. No, it’s probably not true, but it will keep your biscuits safe for all of those who do not get to indulge in the buttery goodness that is Popeyes. Preheat your oven to 425 degrees and line a baking sheet with a piece of parchment paper. Set aside. *New Orleans addition: Serve this with some homemade preserves from Hollygrove Farmer’s Market and you are going next level on all your guests. *Confession: I had no idea what in the world “Matrioshka” meant, so I looked it up, and it led to a video on “Matrioshka Brains,” which blew my mind. Check it out if you have about 25 minutes to feel really uneducated and then somewhat enlightened. Slice avocado in half, remove the pit, peel it and place in a blender. Add all of the other ingredients as well. Blend until smooth. That’s it! 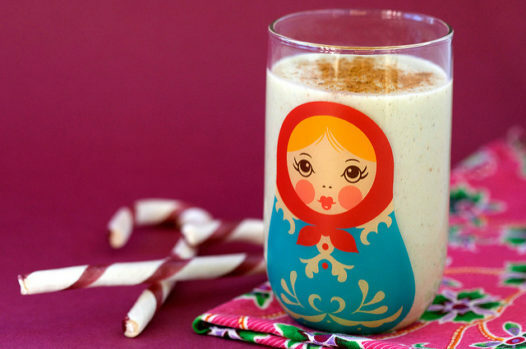 Sprinkle with a little extra nutmeg and garnish with a cinnamon stick if you like. *New Orleans addition: Who are we kidding, add more rum than ever necessary and ring in the holidays right!